April 23rd-29th is National Volunteer Week - a time to express gratitude and appreciation for all who dedicate their time and service to others without asking for anything in return. I am fortunate to see first-hand the impact that volunteers have on an organization that we all care deeply about: your zoo. We are lucky to have a crew of volunteers - folks who give their time in the ticket booth and gift shop, interacting with guests and members. Those who work behind the scenes, caring for animals, shoveling stalls, preparing enrichment activities, and performing sometimes unpleasant tasks with enthusiasm and dedication. They do it for the love of the animals and for the impact that The Zoo has on the children and families who visit. In truth, we would not exist without our volunteers. For those Zoo volunteers reading this, I can never thank you enough for the work that you do - rain or shine, never complaining and always eager to get to work. Your dedication inspires us every day and pushes us to work harder for this amazing community resource. Last year was particularly difficult for The Zoo. Revenue was down, expenses were up, and resources were becoming scarce quickly. To survive, our focus needed to change. The Zoo is an independent, non-profit organization and has been for over 50 years; we exist to serve you. We rely on the generosity of individuals, companies, and foundations for donations; and a committed membership base and strong admissions sales to continue operating. We receive little support from the city and no state funding. Your patronage and support is what keeps us going. Without you, there is no zoo. Thank you for continuing to visit and spreading the word about the great things happening here. I am eager to share with you some new exhibits we have in the works... more information on that will follow in May. Personally, family, friends, and social connections ask why I volunteer here. That's a difficult question for me to answer. The Zoo has had a larger impact than most people know, and more than I tend to share publicly. When I began in this role last Fall, I was coping with the sudden absence of my partner and better half. His favorite animals, the Muntjac Deer, are fan favorites of many who walk the grounds. I know that Chris would be upset to learn that The Zoo was in trouble; moreso if I stood by and did nothing to help. So, here I am. Spending weekends learning how to run a zoo and, along the way, searching for answers and healing. Gratitude to my team - Nick, Amanda, Ben, Emily, Kate, Rachel, John, and all - for their patience with my occasional crazy idea, and for working tirelessly throughout the hardest winter The Zoo has experienced to date. Special thanks to Nunzio Bruno, our board president, for providing support and #amusement to me during the hardest days. I used to think that I understood the importance of volunteering on the outside; how transformative the extra hands, ideas, and help can be to an organization. I never stopped to consider the impact it would have on the volunteer. If you're reading this and you find yourself a little lost or maybe without purpose - consider volunteering. Even if not at The Zoo, your talents, skills, and energy can be put to good work for an organization. During this, National Volunteer Week, where will you consider volunteering your time? For all of the challenges that this winter brought to The Zoo, I'm happy to say that we are open for the season. I look forward to spending this summer with you; listening to the sounds of happy families adventuring through our zoo, hearing memories being made, and knowing the impact that an animal can have, often when someone needs it the most. 16 students from Springfield College donated their time on April 9th to assist with our spring cleanup. They helped remove brush, cleared leaves, raked gardens, and picked up trash around The Zoo. The students donated a combined total of 48 volunteer hours. Thank you, Project Sustainability, for your generous gift of time and effort! Warm welcome to Mary, Corky, and Howard; our 3 newest Zoo volunteers in the ticket booth and gift shop. Over 641 guests joined us on April 15th for our annual Eggstravaganza event. We hope you had an eggcellent time! 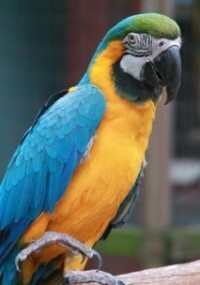 Look for The Zoo On The Go booth at Long Meadowwe Days, May 20-21 in Longmeadow, MA. 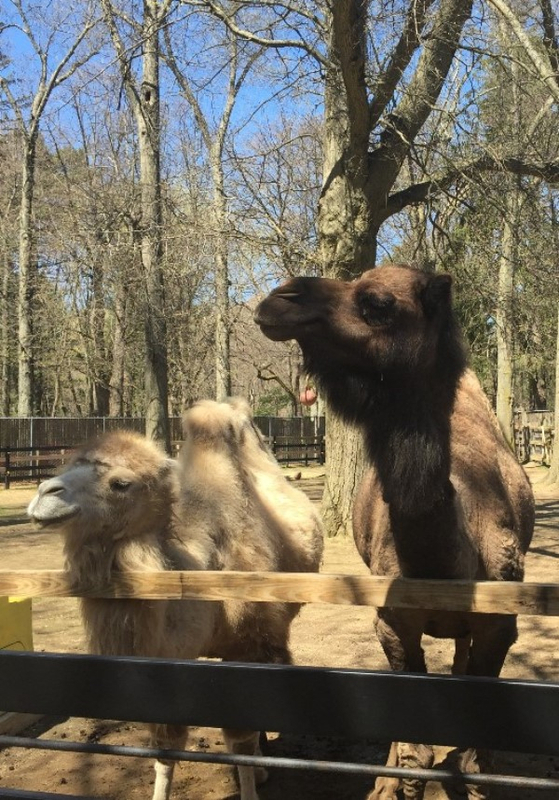 Max and Fergie, our resident Dromedary and Bactrian camels, have captured the hearts of many over the years. Arriving as young adults, Max in 2005 in Fergie in 2008, they have become visitor favorites, never passing up the chance to stop over and say hello. Max weighs approximately 1,200lbs, while Fergie clocks in at approximately 1,100lbs. Max's favorite enrichment activities include pushing his mock-wheelbarrow and giving himself dust baths. Fergie enjoys being groomed and playing with water sprinklers. Come and say hello to Max and Fergie as our 2017 season kicks off!